Daniel "Rudy" Ruettiger, the former Notre Dame walk-on whose life became the basis of one of the greatest sports films of all time, has been sued by the SEC for his involvement in a "pump-and-dump" stock scheme for his sports drink company, Rudy Nutrition. If your childhood dreams were not already lost, then this should do it: Not even Rudy is innocent. 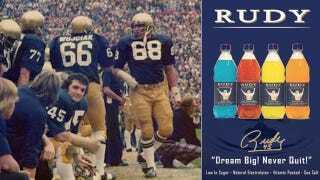 Rudy Nutrition produced and sold modest amounts of a sports drink called "Rudy" with the tagline "Dream Big! Never Quit!" However, the company primarily served as a vehicle for a pump-and-dump scheme that occurred in 2008 and generated more than $11 million in illicit profits. The SEC alleges that investors were provided false and misleading statements about the company in press releases, SEC filings, and promotional materials. For example, a promotional mailer to potential investors falsely claimed that in "a major southwest test, Rudy outsold Gatorade 2 to 1!" A promotional e-mail falsely boasted that in "several blind taste tests, Rudy outperformed Gatorade and Powerade by 2:1." Meanwhile, the scheme's promoters engaged in manipulative trading to artificially inflate the price of Rudy Nutrition stock while selling unregistered shares to investors. The SEC suspended trading and later revoked registration of the stock in late 2008. Rudy Nutrition is no longer in business. Ruettiger, as well as 10 others, has agreed to settle "without admitting or denying the allegations." He'll pay $382,866 in the settlement. What do you know? It turns out we should have sold him short all along.